On September 16, 1969, the barge Florida ran aground off Cape Cod, rupturing its hull and spilling 189,000 gallons of No. 2 fuel oil. Winds and waves pushed the oil onto the beaches and marshes of West Falmouth, Massachusetts, carrying with it dead lobsters, scup, and cod. 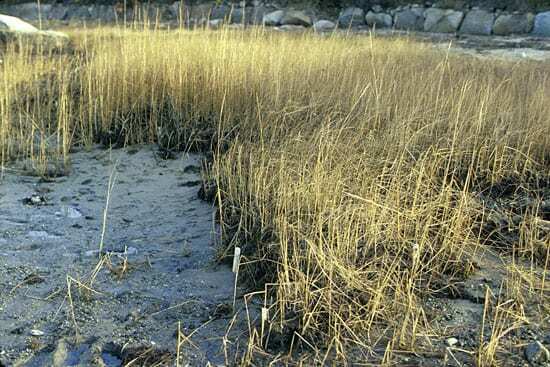 In the weeks and months after the spill, biologists Howard Sanders and George Hampson from the nearby Woods Hole Oceanographic Institution (WHOI) collected samples of mud and animals from the marsh sediments, particularly from an area known as Wild Harbor. They shared their samples with Max Blumer and Jerry Sass, WHOI geochemists who knew how to analyze oil with one of the field’s newest tools, the gas chromatograph. Together, they made a discovery that refuted the prevailing wisdom of the day: Oil lurked in the marsh and sub-tidal sediments long after it was no longer visible in the water and on the beaches. Three decades later, my research group returned to those marshes. Equipped with our own state-of-the-art equipment—a two-dimensional gas chromatograph—we analyzed new sediment samples and made our own discovery. 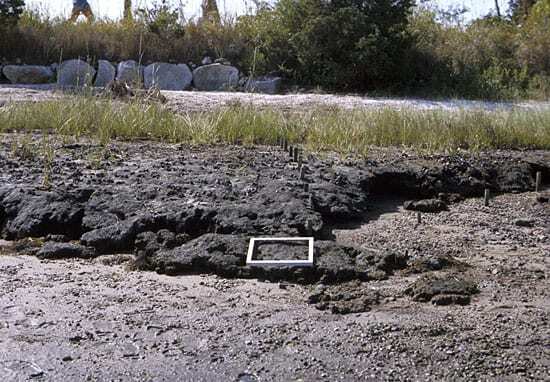 Some of the oil from the Florida spill is still buried in the mud, and its chemical composition has not changed dramatically since the mid-1970s. The Florida oil spill is perhaps the longest studied in history, and it has fundamentally changed our understanding of what happens to oil in coastal ecosystems. We are still building on this groundbreaking research, seeking knowledge that could help mitigate the environmental impact of future oil spills and the costs of cleaning them up. 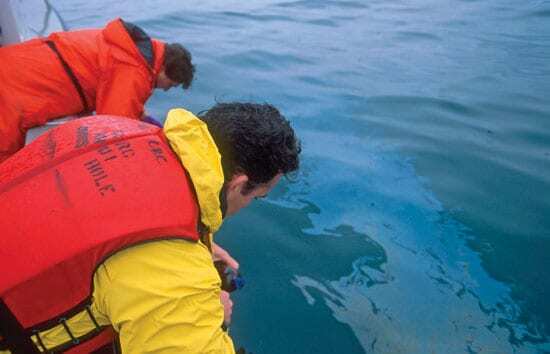 Oil spills are awful for the environment, but they provide an excellent opportunity to study how the ocean and its ecosystems respond to extreme events. Most people see a spill and focus only on its toxic effects. But my group also sees it as a huge injection of carbon-based food for microbes in the coastal environment. We ask questions like: How long does it take the oil to decay and be consumed by microbes? How long will oil persist at a particular location and why? Do people need to intervene and assist in cleanups, or can Mother Nature remediate the ecosystem herself? New England relies heavily on barges for transporting fuel to its major ports and cities. For decades, Buzzards Bay has been a major thruway for oil barges, with approximately 2.1 billion gallons of oil traveling through the Cape Cod Canal each year. With so many barges navigating these rocky and narrow waterways, spills due to mechanical or human errors are almost inevitable. In September 1969, the inevitable happened. 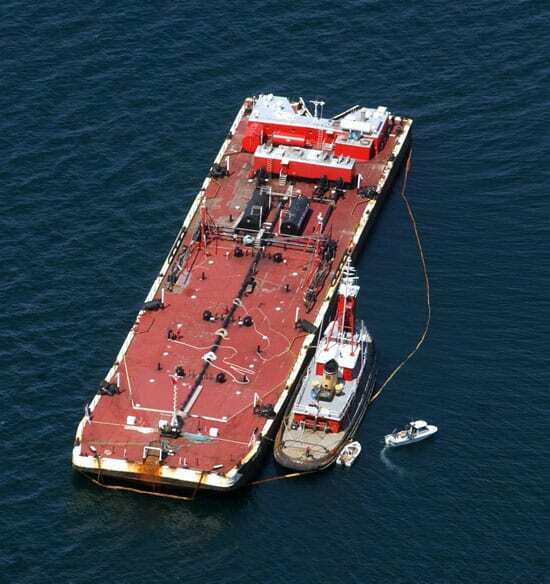 When the barge Florida ran aground, it released the largest amount of oil spilled in Buzzards Bay history. “The oil-soaked beaches were littered with dead or dying fish,” wrote Hampson and Sanders in Oceanus at the time. “Fish, crabs, and other invertebrates covered the shores of the Wild Harbor River and large masses of marine worms, forced from their natural habitat in the sediments, lay exposed and decaying in the tidal pools.” (Download a PDF version of the 1969 Oceanus article, located in related files box to right). Applying the most advanced analytical techniques of his day, Blumer was able to study the chemical composition of the oil from the spill. Oil products such as No. 2 fuel oil are made up of hundreds of individual chemicals that vary in their characteristics, such as volatility, solubility, and toxicity. Blumer was able for the first time to tease out which compounds had evaporated and decayed and which remained in Wild Harbor. He saw some of the oil’s constituent parts, rather than one uniform chemical. WHOI salt marsh ecologist John Teal and graduate student Kathy Burns also studied Wild Harbor through the mid-1970s, and Teal and chemist John Farrington revisited the old spill in 1989. Each time, remnants of the 1969 oil persisted. Several other oil spills have occurred in Buzzards Bay since the Florida spill (Table 1). In October 1974, thousands of gallons of No. 2 fuel oil from the barge Bouchard 65 poured into the bay, with the greatest impact in Winsor Cove, just two miles north from Wild Harbor. 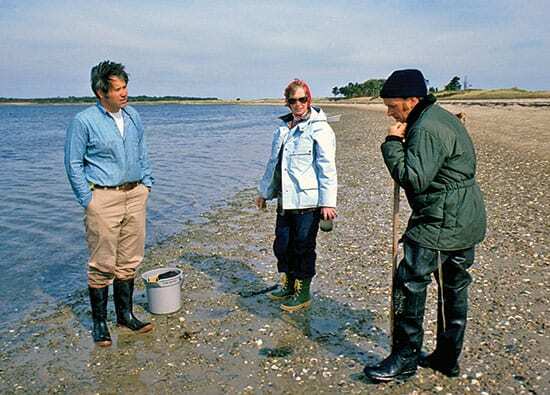 Building on their experience, WHOI researchers measured and chronicled the 1974 spill for comparison with the 1969 event, as both involved the same type of fuel and neighboring but somewhat different shorelines. We have found that oil at Winsor Cove from the Bouchard 65 spill also continues to persist. The amount of oil spilled in each case has been rather small compared to some high-profile spills like the Exxon Valdez. 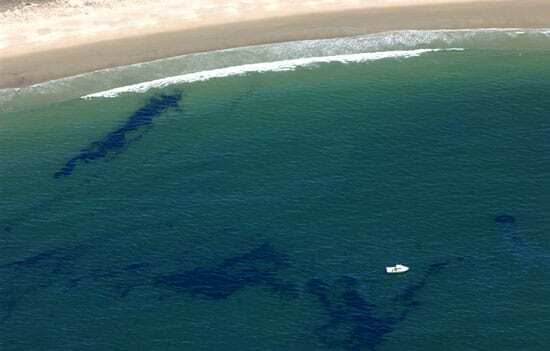 But the convergence of these spills, all occurring within 10 miles of Woods Hole, has created a unique natural laboratory for investigations of the short- and long-term fates of oil in the coastal ocean. Who does the better cleanup job? 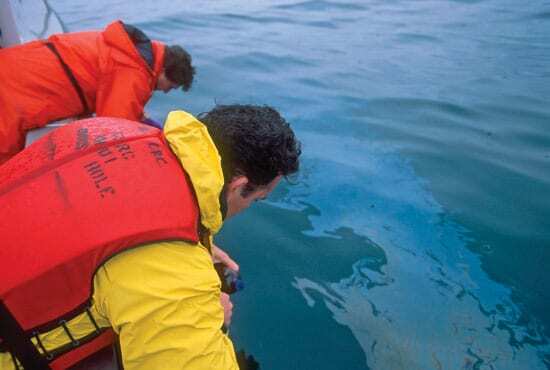 The Oil Pollution Act of 1990 requires that parties responsible for an oil spill must attempt to restore the environment to its pre-spill condition. One popular approach is “natural attenuation,” allowing or promoting natural processes to clean up and remove contaminants from affected areas. Environmental scientists presume that, over time, naturally occurring or artificially transplanted microbes will eat hydrocarbons in the petroleum soup. It is an attractive, feel-good alternative when compared with labor-intensive and costly clean-up schemes, and several studies have shown that natural attenuation can sometimes be as effective as human intervention. In the first days and weeks after a spill, physical processes churn the oil around in the water, exposing it to air and sunlight, causing some compounds to evaporate or be broken up. Then the “bugs” take over. Oil spills can deliver a staggering amount of carbon—that is, food for the ecosystem—in a short period of time. A rough calculation from the Florida spill indicates that 50 to 100 grams of carbon were added to each square meter of the impacted area in one day. By comparison, natural photosynthesis by plants yields about 300 grams of carbon per square meter in an entire year. Petroleum hydrocarbons provide a rich source of high-caloric food for a variety of microbes. In many ways, these microbes match or exceed humans in their chemical skills, using an incredible toolbox of enzymes to break down complex petroleum compounds. But just how do these microbes break down the oil? And why haven’t they eaten all of the oil from the 1969 spill? Answering these questions requires that we learn a lot more about the chemistry and composition of oil and its natural degradation processes. We started by going back to the site of our predecessors’ work in the salt marshes of Wild Harbor and Winsor Cove. We collected dozens of sediment cores, particularly from a site in Wild Harbor that was named M-1 (marsh sample 1) by previous WHOI scientists. Like Blumer a generation ago, we brought a powerful scientific tool to bear on the problem. With colleagues Glenn Frysinger and Richard Gaines of the U.S. Coast Guard Academy, we analyzed our sediment samples using a novel technique called comprehensive two-dimensional gas chromatography (GCxGC) in order to observe how the composition of the 30-year old oil had changed while buried in the marsh. It was the first time anyone had used GCxGC to analyze a real-world oil spill. With traditional one-dimensional gas chromatography (GC, as used by Blumer’s generation of environmental chemists), scientists could identify about 10 percent of the compounds in the oil, a quantum leap for the era. But that process still leaves a haystack of many compounds (such as branched alkanes, cycloalkanes, aromatics) that cannot be identified. 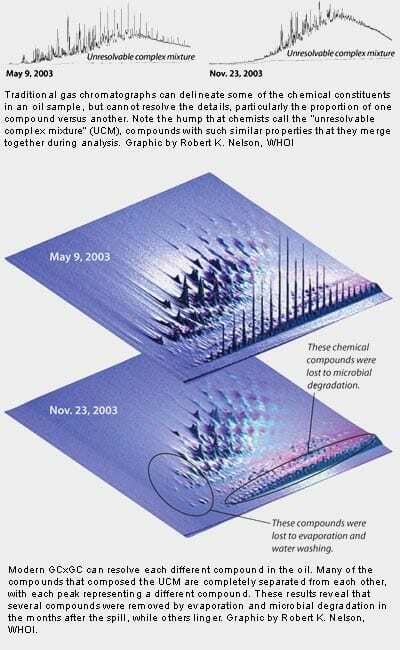 On a data plot, it looks like a large hump that we call the unresolvable complex mixture (UCM). Too many of the compounds have similar properties and when analyzed with a simple chromatograph, they merge together, making it impossible to tell one from the other. With modern GCxGC, we can find needles in that haystack (see bottom of page). We have been able to separate and identify many more compounds and provide a more refined inventory of the petroleum hydrocarbons that persist in the marsh. We found that the oil at the M-1 site had not weathered significantly since the mid-1970s, and most of the compounds typically found in oil are still present after three decades. As we peered into the previously unresolved mass, for instance, we found that certain types of alkanes remain, despite earlier research that suggested they were completely degraded. I doubt many people would have predicted in 1969 that oil from the Florida spill would still be present after three decades. The entire marsh continues to be mildly affected, and there are certain areas along the shoreline where oil is particularly concentrated. Why doesn’t the oil go away? Our findings from Wild Harbor and Winsor Cove suggest that some marsh sediments might be ideal for preserving partially weathered petroleum. Evidence indicates that oil-consuming bacteria may have stopped eating these hydrocarbons more than 25 years ago. Though a diverse community of microbes exists in the contaminated regions of Wild Harbor, they are not actively consuming the remaining oil. We have started numerous experiments to figure out this riddle, and knowing what types of chemicals remain can provide essential clues. The contaminated sediments may now lack oxygen required by some microbes to degrade hydrocarbons rapidly. Perhaps the environment is missing a key chemical species—such as sulfate—that bacteria need to consume and change the remaining oil compounds. Perhaps the chemical bonds and structures of certain oil compounds locked the microbes out, resisting their chemical attacks. Or maybe the microbes prefer to eat more readily available food sources such as plant debris. On April 27, 2003—just six months after we published our findings on the 1969 oil residues in Wild Harbor—the barge Bouchard 120 struck an underwater ledge while being tugged to a power plant. At least 98,000 gallons of No. 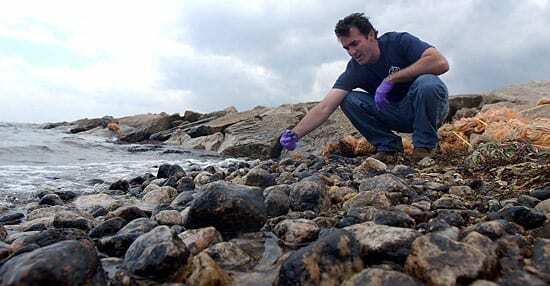 6 fuel oil poured into Buzzards Bay, and within 24 hours, helicopter surveys showed a 12-mile oil slick. Viscous, tarry petroleum washed up on the beaches of one of New England’s richest tourist and shellfishing grounds. Like our WHOI predecessors, Research Associate Bob Nelson and I went to the beaches to collect samples and observe firsthand the war between industrialized society and Mother Nature. We scooped floating “pancakes” of petroleum, filled bottles with oily blue water, and collected tarred cobbles and sediments. After a year of analyzing samples, we have been able to determine the original chemical composition of the Bouchard 120 oil and track how it has changed. Our early results show that several groups of compounds were lost to evaporation, water washing, and microbial degradation. The degradation of oil, however, seems to have stalled after the initial breakup in the first six months. Because the responsible party removed nearly all of the oil-impacted rocks at this site, we can no longer collect samples there. Coastal oil spills are incredibly destructive, with intense short-term consequences and insidious long-term ones. No one wants to witness an oil spill, but they happen. And when they do, we need to take advantage of the opportunity to learn from them. WHOI is an extraordinary place to do that, thanks to three decades of samples and memories in these labs. As recently as June 2004, Bruce Tripp, a long-time member of the research staff and participant in the earlier oil spill studies, handed me a dusty jar he had recently found in a storeroom. It was a sample of oil collected by WHOI scientists in 1974 from the Bouchard 65 spill, which will be invaluable for our continued work on coastal spills. —The National Science Foundation, the Petroleum Research Fund, the Environmental Protection Agency, the Office of Naval Research, and the WHOI Coastal Ocean Institute provided funding for this research. —Science writer Mike Carlowicz and Research Associate Robert Nelson contributed to this article.